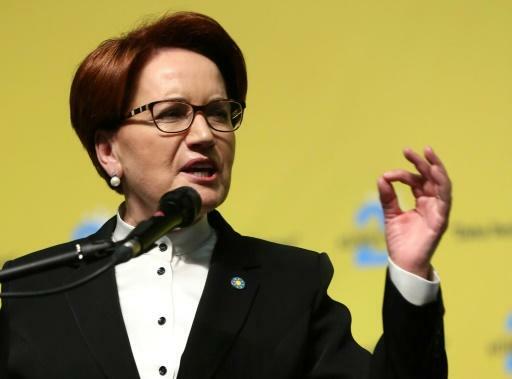 Turkey's nationalist Good Party re-elected Meral Aksener as its chief on Sunday, even though she had vowed to step down following her heavy defeat in the presidential election in June. Aksener had said last month she would step down after coming only fourth in the June 24 election, while President Recep Tayyip Erdogan won a resounding victory and saw his powers increased substantially. But senior figures in her party insisted on putting Aksener's name forward again as leader at the party congress in Ankara. "We are not practising in our party the one-man model that we oppose in our country's administration," Aksener told delegates to a standing ovation. Hopes had been high that Aksener would be able to erode some of the conservative-nationalist vote that Erdogan considers his own. But she received only the most limited airtime, in what her supporters said was a deliberate attempt to gag her. Her congress speech on Sunday was, nevertheless, covered by main news channels. The main opposition Republican People's Party (CHP) was also left in turmoil in the wake of the presidential vote. Aksener raised the issue of the collapse in the Turkish lira, which fell 16 percent against the US dollar on Friday amid a diplomatic spat with the United States over a number of pressing issues including the detention of a pastor. "Difficult days are ahead of our country," Aksener said, in criticism of Erdogan's policies. "We could pay a high price in a bid to rescue the economy from dire straits."